When Joshua Safran was four years old, his mother--determined to protect him from the threats of nuclear war and Ronald Reagan--took to the open road with her young son, leaving the San Francisco countercultural scene behind. Together they embarked on a journey to find a utopia they could call home. 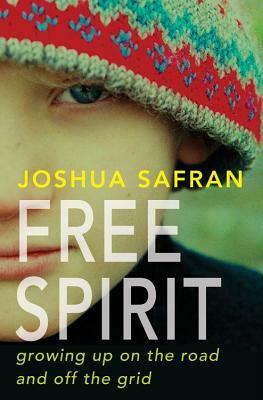 InFree Spirit, Safran tells the harrowing, yet wryly funny story of his childhood chasing this perfect life off the grid--and how they survived the imperfect one they found instead. Encountering a cast of strange and humorous characters along the way, Joshua spends his early years living in a series of makeshift homes, including shacks, teepees, buses, and a lean-to on a stump. His colorful youth darkens, however, when his mother marries an alcoholic and abusive guerrilla/poet. Throughout it all, Joshua yearns for a "normal" life, but when he finally reenters society through school, he finds "America" a difficult and confusing place. Years spent living in the wilderness and discussing Marxism have not prepared him for the Darwinian world of teenagers, and he finds himself bullied and beaten by classmates who don't share his mother's belief about reveling in one's differences. Eventually, Joshua finds the strength to fight back against his tormentors, both in school and at home, and helps his mother find peace. But Free Spirit is more than just a coming-of-age story. It is also a journey of the spirit, as he reconnects with his Jewish roots; a tale of overcoming adversity; and a captivating read about a childhood unlike any other. Joshua Safran is an attorney, writer, speaker, and occasional rabbi, and was featured in the award-winning documentary Crime After Crime, which premiered at the 2011 Sundance Film Festival and had its television debut as part of the Oprah Winfrey Network (OWN)'s Documentary Film Club. He is a nationally recognized champion for women's rights and a zealous advocate for survivors of domestic violence and the wrongfully imprisoned. For his work he has received national media coverage and numerous awards. He lives in Oakland, California. "Instantly captivating, heartbreaking, inspiring...[An] almost-too-crazy-to-be-true story. This book is nothing short of remarkable." "[A] beautiful, powerful memoir. This assured debut is reminiscent of David Sedaris's and Augusten Burroughs's best work: introspective, hilarious, and heartbreaking." "With engaging story after story and a healthy dose of narrative tension throughout, Safran all but turns the pages for you." "An enthusiastic, bounding picaresque...Safran is funny, engaging and a great storyteller." "Poetic, and compelling...In this important book, Safran offers up the wounds of a flower child, and every frayed petal is astonishingly beautiful." "A remarkable account of survival despite the odds."